I didn’t know my first dog too well. His name was Pepe and he was a poodle. I developed allergies and Pepe went to live with my grandparents in Baton Rouge, LA when I was three or so. I met him once more, when I was about 11. He was grey. Seemed nice enough. I hadn’t thought about being able to own another dog since then. His kennel name is Farmsworth Chatter and he has a much more distinguished lineage than do Mrs. E. and I. He is Yankee, but very nice and seems quite taken with the Southern clime. When we adopted him, he was nicknamed “Bear”, which we found ridiculous for a 15 lb animal. 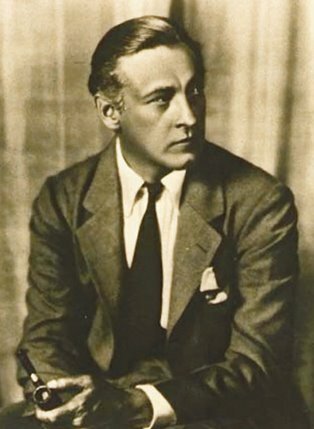 He had a way of sitting in profile that reminded me very much of John Barrymore. It wasn’t too far off and he seemed to adjust just fine. Barrymore was Mrs. E.’s birthday present. Pre-children she would knit him sweaters and actually kitted out a houndstooth number with an alligator belt of mine that had seen better days. One day, he looked over at me, walked across the couch, sat on my lap and became “my dog.” Not long after that, he came up all teeth between me and a mugger. Neither of us was shot and I believe that Barrymore did much to limit the duration of the encounter. Since then he has been rechristened many times, after many an exploit, the latest not one week ago. He is: Sir Barrymore, The Dread Pirate Wetbeard, Squirrel Bane, Chipmunk Breath and ‘Possum Scourge. He is my first dog. And a fine one at that. Always good to have a Princess Bride reference. What a good dog face! I went years [say, 10 to 47] without a dog and now we have a big old abandoned Aussie Shepherd/Chow who is the nicest animal I have ever known. Looks kind of ferocious in the back yard though. Just the thing. AND we now have a Papillion, Grammy, who runs the inside of the house. Nine pounds of constant food-hound. What next? Oh, Turling, I howled too when I saw the Princess Bride ref. I love that movie. Nothing beats a dog with loads of charmisa. What a cute (and brave!) boy! 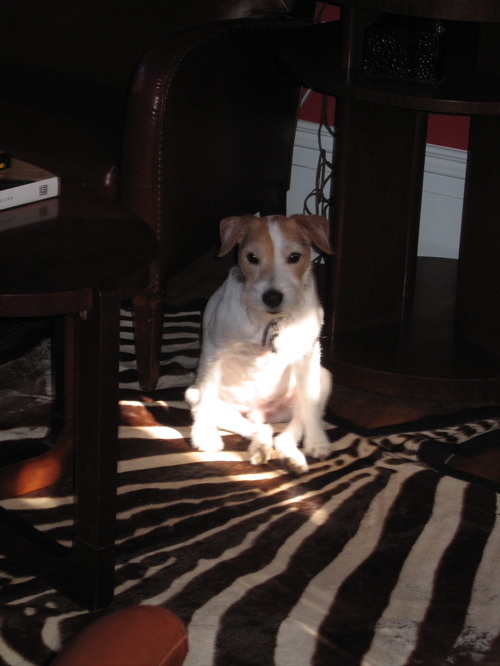 I have a Jack Russell terrier and he is the love of my life. (My husband understands the accolade.) We brought him home from a vet in northern Georgia at 6 weeks old. We named him Carlos. We moved to Boston, but he loves warmth and prefers hot days. I call him ‘my southern dawg”. At 15, he moves slower and enjoys naps more, but he is still quite an athlete, bounding like a pirate from the first step after a squirrel in the yard. He has the same dreamy, lovey face as your Barrymore. I try to make everyday dog-perfect for him – a chunk of ham, a roll in the grass, a run on the beach, a ride in the car, the last of the ice cream in the bottom of the bowl. Oh Barrymore is a prince among cannines! I recently took this little fellow into my life, http://bennybattlesparvo.blogspot.com/ and can only hope he will be as loyal and loveable. That was the sweetest post – and then to see Sir Barrymoore’s face staring into our eyes. I can tell – you really love him – he’s a lucky little fellow! 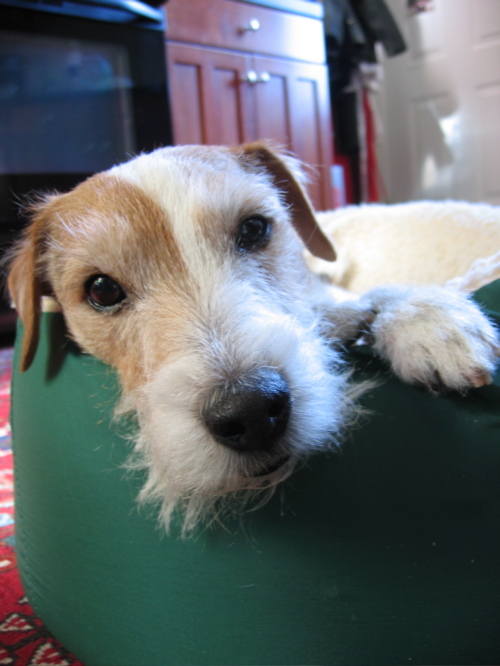 From Best In Breed…God loves a terrier. Have a Westie wife and I told our daughter that had we gotten Spud the Westie before we had her, there was a chance we wou have stopped with Spud. Adorable puppy and a very good photograph of him. Everyone needs a dog! Sir Bentley would like Sir Barrymore to know that he looks like one fine, easy and elegant stud! Must be hard to play second in your house. Does he have a straw boater and a seersucker jacket for Summer? Dr. Kuhn and Co. saved Barrymore’s life when he suddenly couldn’t digest protein…. Benny’s in good hands. Oh Mr E&EL you forever have a gold star in my book. I am such a dog lover! We have now had 3 dogs in our 16 years of marriage. All seem to go through the “my dog” stage with both of us. But the line, “He is Yankee, but very nice” takes the cake. I LOVE it!! Barrymore is the perfect name! Considering I am not a dog person, they have always made me feel uncomfortable and I can’t stand the sound of a bark, your lovely pup melted me enough to entertain the notion of a pup just like him (and of course a cat too). He’s lovely and what a face!